Learn about the issues related to hospital slip and falls, including causes, duty of care, damages, and proving your case. There is no shortage of hospitals in South Florida: from Mount Sinai Medical Center in Miami-Dade County, to Memorial Hospital in Broward County, and Good Samaritan Hospital in Palm Beach County; there are dozens of health-care facilities offering hospital-level medical care here. Sometimes being in close proximity to a hospital can mean all the difference between life and death. So, having all these hospitals in South Florida is important to all of us. However, unfortunately, hospitals are not immune to having a slip and fall occur on their premises. Accidents can happen in hospitals every day due to foreign substances on the floor, poor lighting, loose handrails, and other issues caused by the hospital’s negligence. Should you have to visit any of these medical facilities you may expect to see clean, sterile, well-lit environments with alert, competent staff and service workers. However, hospitals are enterprises run by corporations overseen by boards of directors and a management and maintenance staff, just like many other business locations. Sadly, the reality is that mistakes, like poor or improper maintenance, are made in these facilities just as they are in schools, grocery stores, restaurants, and shopping malls. In fact, some of these mistakes have caused slip and fall and trip and fall injuries as well as other common premises liability related accidents (like elevator accidents or injuries caused by negligent security). Who Are The Most Common Victims Of Hospital Slip and Falls? Often times, the slip and fall victim is an employee of the hospital. For example, a lab tech, a nurse, or a doctor may lose their footing in the course of doing their job and fall, sustaining serious injuries. However, the most common slip and fall victims at a hospital are patients, those who may be vulnerable to falls due to their ill health or recovery process, as well as loved ones visiting patients, and third party service providers (delivery men, gift store employees, cafeteria staff, etc.). What Are The Causes Of Most Hospital Slip and Fall Accidents? Poor lighting in hallways, parking garages, or patient rooms. How Do You Prove That The Hospital Was At Fault? In order for a victim to prove that the hospital caused their slip and fall, the victim must show that the hospital breached its duty (see next sub-heading) in maintaining the premises in a reasonably safe condition. Proving fault can be achieved through physical evidence and testimony. For example, if someone was hurt in a slip and fall in a hospital cafeteria due to spilled orange juice after the breakfast was served, then the injured person will want to ask someone to take pictures of the clothes he or she was wearing and the orange juice on the floor, and gather any witnesses to testify. Additionally, if a hospital employee who came to help the victim said something along the lines of, “I told the maintenance crew to clean this spill up half an hour ago,” this would be a statement that the victim would want to put in writing, as it could be crucial to proving his or her claim. Do Hospitals Owe a Duty of Care Like Any Other Business in Florida? Regardless of whether the hospital operates as a for-profit enterprise or a non-profit endeavor, the premises liability laws of the State of Florida provide that the hospital has a duty to keep those invited onto its property safe from harm. This means that a hospital has a legal responsibility to protect staff, employees, visitors, and patients from accidents. If the hospital fails to meet its duty of using reasonable care, then it can be held liable for damages. What Types of Compensation Can a Victim Receive? How dangerous and vulnerable are Florida hospitals to slip and fall accidents? Studies have been conducted on this issue by researchers at the Centers for Disease Control and Prevention (CDC) and the Department of Labor’s Occupational Safety and Health Administration (OSHA), in addition to private research groups contracted by insurance carriers and hospitals themselves. Additionally, the government at both the state and federal levels has passed laws and legislation that have made hospital premises some of the most heavily regulated areas of any industry operating in the United States. OSHA has 115 different agencies that work to regulate and monitor the health care industry in some way. Slip and fall injuries in hospitals are the most frequently reported adverse event among adults in the inpatient setting.If you were injured in a hospital, there is a high chance that it was as a result of a slip and fall accident. See, Quigley, P., White, S., (May 31, 2013) “Hospital-Based Fall Program Measurement and Improvement in High Reliability Organizations” OJIN: The Online Journal of Issues in Nursing Vol. 18, No. 2, Manuscript 5. (10). Improper use of floor mats and runners. Workers in a hospital setting are particularly vulnerable to slip and fall accidents. If you work at a South Florida hospital, then your risk of being hurt on the job in a fall is higher than if you worked somewhere else. Improper use of ladders and stepstools. What Can Be Done To Prevent Slip and Fall Accidents in Florida Hospitals? What can be done to keep people safe from a fall while on the premises of a Florida health care facility? 5. Exits must be kept free from obstruction and access to exits must alway be clear. 29 CFR 1910.36(b)(4). The hospital should study its history of slip and fall and trip and fall accidents. They should collect past claims and demands by victims, as well as workers’ compensation claims, incident reports, and occupational health nurse logs. From this, the most common dangers and risks can be identified and fixed (or minimized). The hospital should have someone assigned to go out and check the premises for these fall hazards on a regular schedule. Anything she finds should be documented through photos, videos, etc., and the person in charge of fixing this hazard should be instructed to fix it by a set time and date. Training should be given to all hospital staff at all levels about the dangers of slip and fall accidents and the risks and hazards. This includes having written housekeeping procedures that require all employees (including nurses on the floor and other medical personnel, not just staff) to immediately report these hazards, like a spill, and to get a prompt response by housekeeping or facilities departments so the hazard can be removed as soon as possible. Are There Different Legal Avenues For Pursuing A Hospital Accident Claim? If someone is injured in a slip and fall accident at a Florida hospital, Florida’s premises liability laws protect the victim by allowing him or her to seek compensation for their injuries. However, which laws will apply will depend on the status of the victim. (4) damage caused by the injury to the plaintiff as a result of the defendant’s breach of duty. 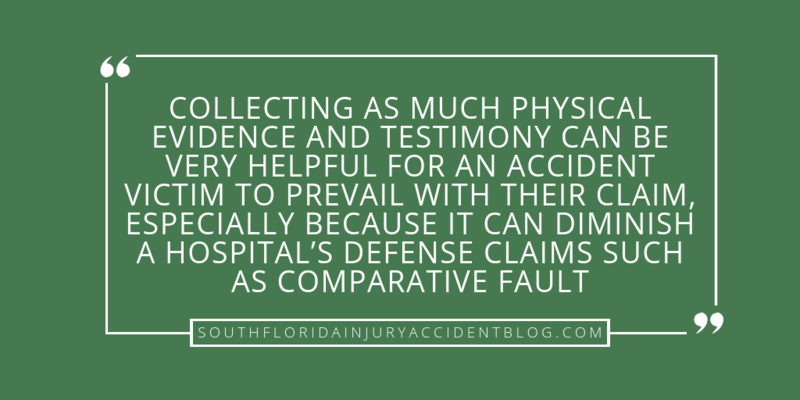 For a visitor or patient that is hurt in a fall at a hospital, their negligence claim against the hospital is prosecuted like any other Florida premises liability claim. Meaning, if a settlement cannot be reached, then the victim can file a civil lawsuit to prove the hospital was negligent and recover his or her damages. However, if the victim was working on the job when they fell on the hospital’s property, then they may have to seek justice in another forum if they can’t settle their case. Here, Florida workers ‘compensation laws exist to protect those hurt on the job. Claims for damages are presented differently in these cases, and determinations are made in accordance with the Workers’ Compensation System. While there may be no difference in how a non-employee and the employee can get hurt in a slip and fall accident, there are certainly differences in the way that their claims are processed and adjudicated. Employees are required to file a workers’ compensation claim and follow administrative avenues to settle any disputes, while non-employees proceed by filing a claim with the hospital’s insurance carrier and use the standard civil route in the event of a dispute (by filing a lawsuit). There may be complications that change whether or not a case will be handled by the civil courts or worker’s compensation. For example, what if the worker had clocked out and was leaving to go home when they fell? For employees, it will be important to determine if they were “on the job” at the time of their accident. If the victim was not legally “at work,” then their case may proceed as any other civil case (where damages may not be confined to the Workers’ Compensation System framework). Do You Have a Slip and Fall Claim Against a Florida Hospital? If you have been the victim of a slip and fall accident in a South Florida hospital, then you should pursue your premises liability claim, just like you would against any other business location. Just like other business owners, hospitals may be legally obligated to compensate victims for their injuries, including their lost wages from not being able to work, their medical costs, rehab expenses, as well as other economic and non-economic damages. This is especially true if the victim can find evidence that the hospital failed to follow an OSHA regulation, like those listed above, or if the hospital did not comply with its own internal safety protocols. A good piece of advice if you have been harmed by a slip and fall at a hospital, is to speak with an experienced personal injury lawyer to learn about the issues that can arise with these claims, including the type of evidence needed to prove a claim and the type and amount of damages you can recover. Most personal injury lawyers, like Alan Sackrin, will offer a free initial consultation (over the phone or in person, whichever you prefer) to answer your questions.